“D. Fleming Lucas and Trixie. From Will & Edna.” Studio photograph on postcard. T. A. Morgan, photographer, Morgantown, West Virginia, 1920s. When I purchased this postcard, I was especially taken by toddler D. Fleming Lucas’ onesie, which clearly covers a bulky layer of diapers and a woolen diaper cover. (Latex or rubber pants for babies seem to have appeared on the scene in the 1920s but, from his profile, I would guess that young Master Lucas is not wearing them.) I was also charmed by Trixie’s expression. I think she looks as though she smells something funny and is fighting her canine impulses to investigate further. She’s not looking at the photographer, although the toddler is. She is probably looking at her owner, Master Lucas’ mother or father, and notice how her ears are folded back. She’d like to get down from that chair, but she’s being good and holding very still. 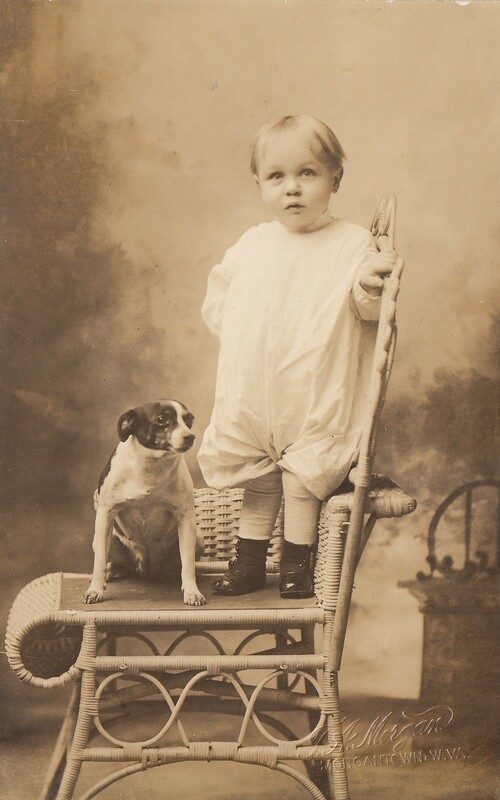 It is remarkable how many studio photographs of babies with family dogs survive from the nineteenth and early twentieth centuries. I’ll share more in future posts and offer a consideration of the posing conventions that had already developed by the 1860s. For now, however, enjoy Trixie and her (probably) fragrant young friend.